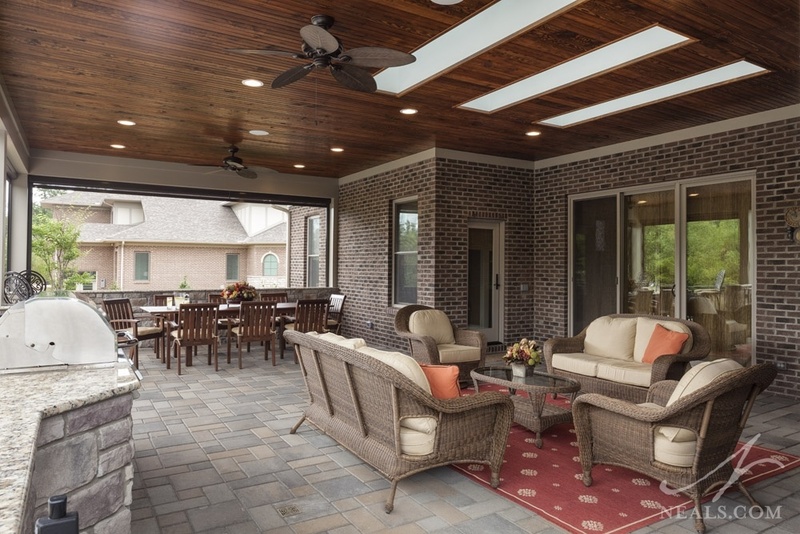 Almost immediately after moving into their newly-constructed house, the homeowners realized that the existing outdoor living space would not fulfill their needs. 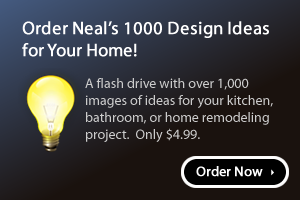 The focus of this remodel was to enlarge the existing space without completely starting over, as well as to correct some of the existing functionality issues. The new expanded porch offers lots of comfortable space for the family and looks as if it had been part of the original construction. 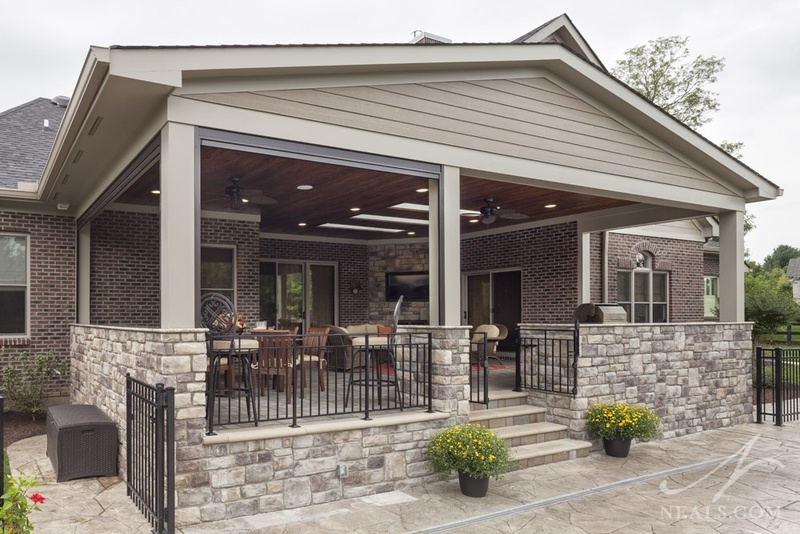 This project is a 2016 NARI Contractor of the Year Local Residential Exterior Winner. Keep as much of the existing outdoor structure as possible. Find a better location for year-round grilling. Implement solutions to allow the western-facing space to be usable on sunny afternoons. Limit the impact of lost natural light to the home’s interior with the addition of a larger porch structure. 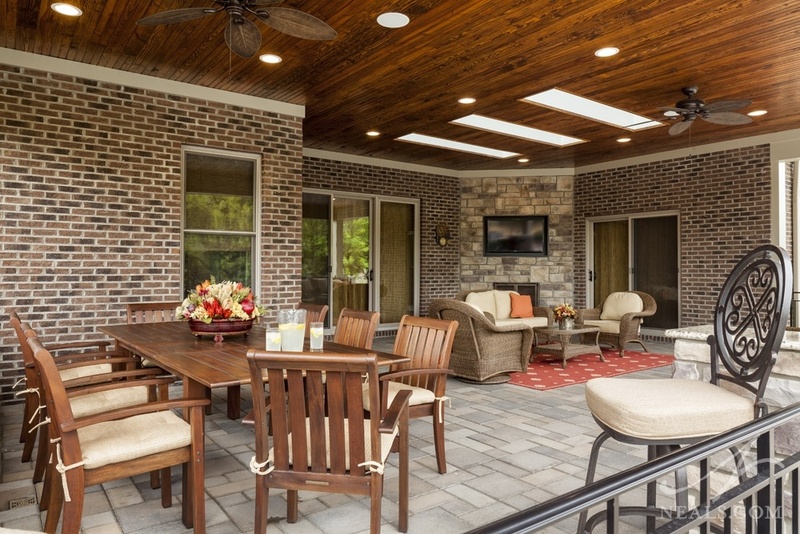 Leave enough space between the expanded porch and existing pool for family activities and traffic flow. Retain as much of the pool fencing as possible, or design solutions to make up for losing sections of it. As the existing home was less than 2 years old, the homeowners wanted a solution that wouldn’t result in losing more of the materials already in place than necessary. The new porch blends into the old in the ceiling, and a stone paver floor conceals the addition underfoot. In order to avoid affecting the drainage valley from the existing rear gable, the new second gable was pitched lower so that its centerline would line up with the existing roof line. The lower pitch also helps to bring the new structure down to a more human scale. Stone walls then brings the look of the existing fireplace to the outside, and the new gable siding matches the existing. 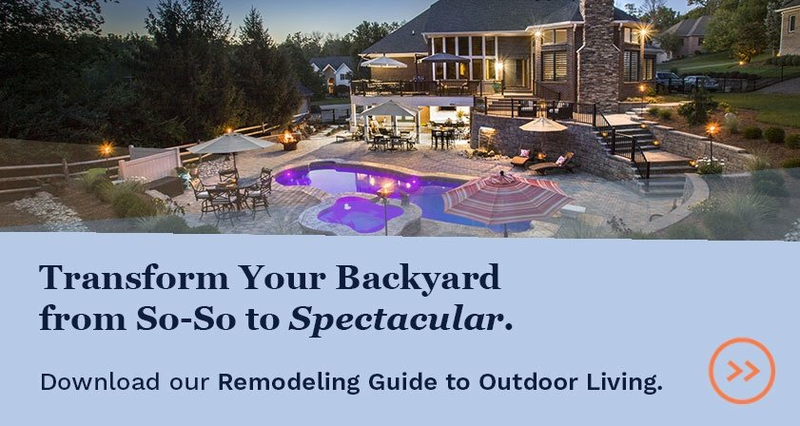 When the home was built, the outdoor living space was treated like a tacked-on last minute feature. As a result, the grill area and serving station ended up placed in an awkward, and inconvenient spot to the far side of the patio. In the new porch, the grill found a home at the front of the space. Still covered for year-round use, the grill is close enough to the edge of the structure and positioned to utilize existing typical wind conditions to not require ventilation. 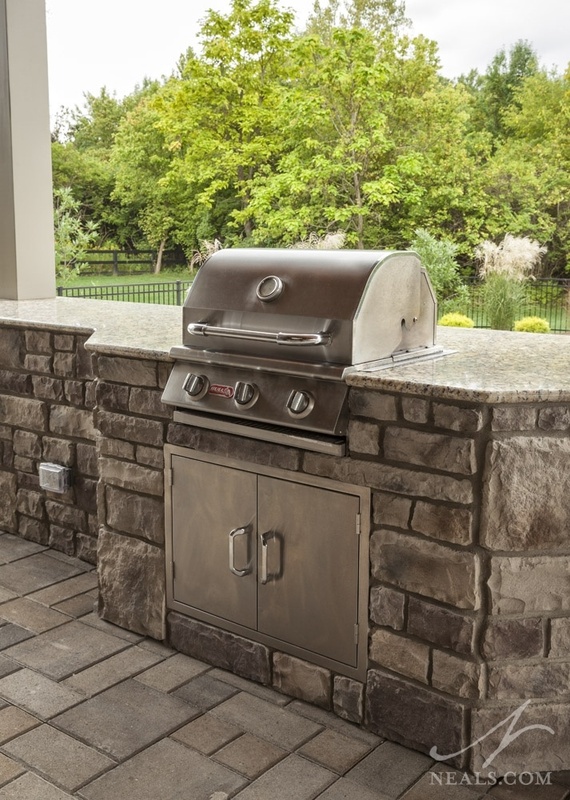 The position also makes the grill the center-point of the entire outdoor space. The cook can easily see the entire pool area, and scan the entire porch from that vantage point. The back of the house faces west. In the afternoon, blinding sunlight streams in. To filter the light into the exterior space, large automatic screens were installed on the corner of the structure. The material is a dense screen that acts as a filter without completely blocking out the light. The screen on the side of the porch is also intended for privacy from the neighbor’s back yard. The screens don’t completely envelope the porch, however, so that the afternoon sun can still reach the existing sliding doors flanking the exterior fireplace and TV. To get natural light to the back of the porch and into the home, three deep skylight wells were installed in the original roof. They are positioned closer to the house rather than centered in the porch ceiling to channel light to the space just outside of the sliding doors. To maximize the light even more, two skylights were installed side-by-side per well, and the well itself was finished in white to reflect more of the sunlight. The skylights were installed in between the existing structure’s trusses. The skylights also help balance the dark beaded wood ceiling, an original feature the homeowners liked. Recessed lighting adds additional lighting. The scale of the expansion was primarily dictated by the maximum proximity to the pool area. The existing pool has an irregular curving perimeter which created a narrow alley in one spot between the existing fencing and the pool edge. The expansion does not pass beyond that original fence line to keep the corridor at that width. Extending the porch out to that point allowed for the design of a side entry. The stairs of the side entry are angled out to meet the existing patio and preserve the landscaping. 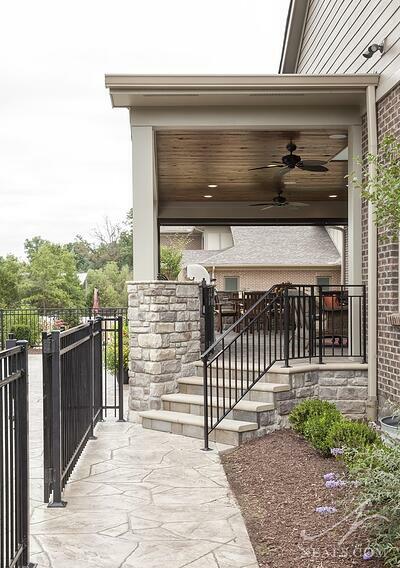 Originally, a fence surrounded the pool, and a fenced railing was installed on the porch. 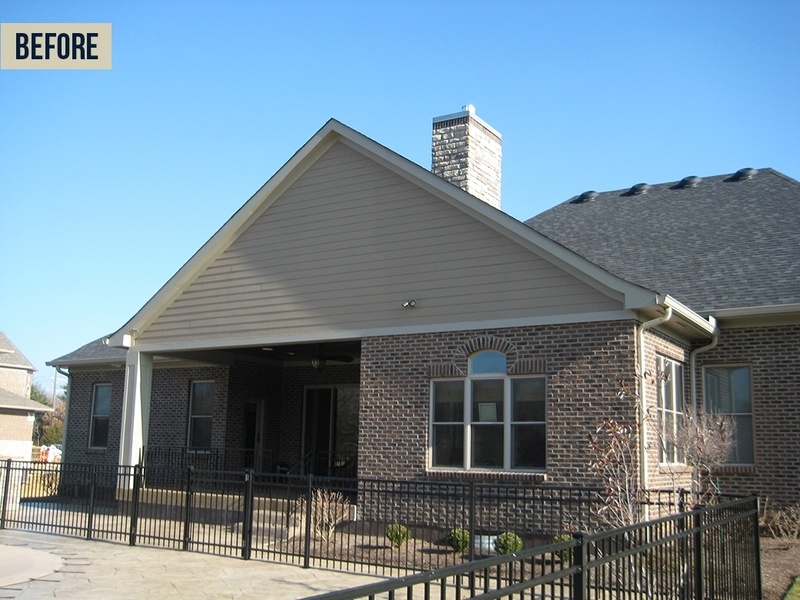 The front of the new porch acts as a barrier, eliminating the need for a section of the fence. Instead of discarding all of the obsolete pieces, the railing from the old porch was salvaged during the demolition phase, then worked into the design of the new one. The two sets of stairs on the porch were fitted with gates as well so that the pool child-proofing was maintained. The holes left from the removed fencing posts were filled in to blend with the stamped concrete pool deck.